How to speak Sabah? Rule No. 1: You understand what, how, when to use the word "Bah". How to speak Sabah? Rule No. 2: You understand what, why we suddenly shout, "Aramaiti!". How to speak Sabah? Rule No. 3: You understand what, why we say "limpas" when you block our way. How to speak Sabah? Rule No. 4: You know "Buduh" in Sabah is not the Fish Sauce from Kelantan. How to speak Sabah? Rule No. 5: When we were kid, we like to play "bubut-bubut"! How to speak Sabah? Rule No. 6: We hate "giuk" in our mango! How to speak Sabah? Rule No. 7: You know how "Sabah" got its name. How to speak Sabah? Rule No. 8: You must have a mouth! I know what you want to say. "Palui", right? How to speak Sabah? Rule No. 9: When we were kid, we're not only like to play "bubut-bubut" but also "tapuk-tapuk"! How to speak Sabah? Rule No. 10: No, no, no! "Pigi" is not an animal! How to speak Sabah? Rule No. 11: Don't get bother about us. We are just "sakai"! How to speak Sabah? Rule No. 12: WE LOVE "BAMBANGAN"! How to speak Sabah? Rule No 14: Sabahan "sumandak" is the BEST!!! How to speak Sabah? Rule No 15: "Matai"! Bills coming in!!! Do you know Che'Nelle? Which her songs really famous in Japan also listed on Billboard top 100? Well some say yes and some say no.. she's actually from Putatan, Sabah but growing up in Perth, Australia.. She's not that famous here in Malaysia but she's a wowowee in other country.. well you know... people only appreciate if something foreign for them and not local.. same happen to some American artist before like Tommy Page.. Richard Marx.. more famous in Asia than in US. Amber Chia the international supermodel.. she may look weird.. designer and photographer really dig weirdness of people. She's also from Sabah..from Tawau.. Some says she's from Ambar Park, Kuhara Road, Tawau. 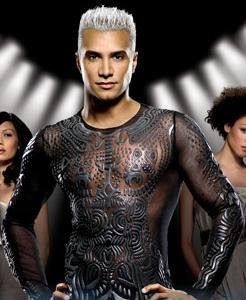 This is the mystery of all.. one of the jury from American Next Top Model and E News reporter... Mr. Jay Manuel. "Manuel was born in Toronto, Ontario to a mother of Italian and Czech descent and a South African father of Malaysian and Dutch descent. He was raised in Toronto" and some sources says, his father is a Sabahan. It's normal for mix-marriage here in Sabah.. even me consider a hybreed.. Just imagine he always says "Ya, Ya" in every ANTM shows.And Tyra had asked him about why with the "Ya, Ya", he said it means "Yes" from his father-side.. and not "Yer, Yer" like our west-Malaysian friend's says..